John Wooden coached UCLA's basketball team for 27 years. NEW: UCLA AD: "There will never be another John Wooden"
Visit SI.com for complete coverage of John Wooden's death, including a photo retrospective. (CNN) -- He was known as the Wizard of Westwood, the architect of a dynasty at UCLA that will never be equaled. But John Wooden leaves behind a legacy much larger than victories on a basketball court. Wooden died Friday of natural causes at Ronald Reagan UCLA Medical Center. He was 99. His 100th birthday would have been October 14. Wooden's children, Nan and Jim Wooden, issued a statement asking that donations be made in his name to the Juvenile Diabetes Research Foundation or another charity of choice. "He has been, and always will be, the guiding light for our family. The love, guidance and support he has given us will never be forgotten," the said. "Our peace of mind at this time is knowing that he has gone to be with our mother, whom he has continued to love and cherish." Wooden had been admitted to the hosptial on May 26. Funeral services will be private, but the family said there would be a public memorial at a later date, with a reception for former players and coaches. "There will never be another John Wooden," said UCLA Director of Athletics Dan Guerrero. 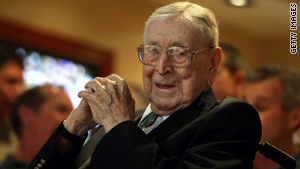 "While this is a huge loss for the Bruin family, Coach Wooden's influence reaches far beyond Westwood. Coach was a tremendously significant figure. "This loss will be felt by individuals from all parts of society. He was not only the greatest coach in the history of any sport but he was an exceptional individual that transcended the sporting world. His enduring legacy as a role model is one we should all strive to emulate." "This is a sad day at UCLA," said UCLA Chancellor Gene Block. "Coach Wooden's legacy transcends athletics; what he did was produce leaders." Wooden was born on a farm in Martinsville, Indiana, in 1910 and learned to play basketball on an iron hoop that his father had forged and attached to the barn. He went to college at Purdue, winning All-America honors three times and leading the Boilermakers to the 1932 national collegiate championship. After marrying his high school sweetheart and life-long love Nell following his graduation, Wooden coached at the high school level and at Indiana State before being hired by UCLA in 1948. His coaching methods, like his upbringing, seemed like something out of a Norman Rockwell painting: Simple, yet elegant. "If there's anything you could point out where I was a little different, it was the fact that i never mentioned winning," he once said. In 27 years at UCLA, his Bruins won an unprecedented 10 national championships in 12 years, including seven straight from 1967 to 1973. UCLA also captured 19 conference titles and set an NCAA record with 88 consecutive wins over four seasons, but Wooden was more proud of his players accomplishments off the court. "I think that's the factor from which i have received the greatest satisfaction and pleasure. The fact that practically all of my players did get their degrees and practically all of them have done well in whatever their chosen profession might be," he said. Wooden retired from UCLA in 1975, following his 10th national championship but would occasionally take in a Bruins game from the stands. Former Cal coach Pete Newell once said, "John was a better coach at 55 than he was at 50. He was a better coach at 60 than at 55. He's a true example of a man who learned from day one to day last." Wooden is a member of the Basketball Hall of Fame both as a coach and as a player -- one of only two men to attain that honor -- and many of the men he coached went on to stellar careers as well. Kareem Abdul-Jabbar (then Lew Alcindor), Gail Goodrich and Bill Walton all landed in the Basketball Hall of Fame beside their college coach, while others played in the NBA or even returned to UCLA later in Wooden's footsteps. But Wooden's legacy extended beyond his basketball expertise -- he coached leadership. He frequently recited what he termed his father's "two sets of three" -- "never lie, never cheat, never steal" and "don't whine, don't complain, don't make excuses." And his well-known "Pyramid of Success," begun in the 1930s, has been the system behind the success of many. "His 'Pyramid of Success' hangs in my office to remind me every day of what it takes to be an effective leader," Block said. "He was truly a legend in his own time, and he will be a legend for generations to come." Wooden himself called the pyramid "the only truly original thing I have ever done." The base of his five-level pyramid is made up of industriousness, friendship, loyalty, cooperation and enthusiasm. The next levels up are self-control, alertness, initiative and intentness, then condition, skill and team spirit followed by and poise and confidence. At the pinnacle is competitive greatness, which he defined as performing at top ability when that is required -- "each day." "Success is peace of mind, which is a direct result of self-satisfaction in knowing you made the effort to become the best of which you are capable," Wooden once said in explaining the pyramid.